The Houma-Terrebonne Civic Center contributed an estimated $10.2 million to the local economy in 2012 according to a new economic impact report. The independent study was conducted by The University of New Orleans Division of Business and Economic Research. 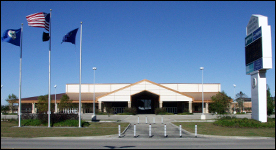 During 2012, 112 unique events were hosted at the Civic Center bringing in a total of approximately 125,000 people, of which 30% were from outside Terrebonne Parish. The study does not include the spending of local residents of the parish who attended events at the Civic Center. The study found that in 2012 the Civic Center generated $6.9 million in direct spending and $3.3 million in secondary spending accounting for a total economic impact of $10.2 million. Furthermore, the facility generated a total of about $0.6 million in tax revenues for the state and local government.